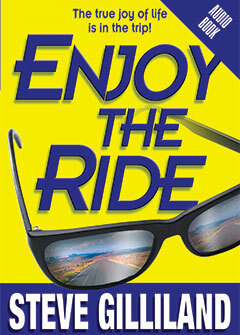 In ENJOY THE RIDE, author Steve Gilliland shares from his heart HOW TO EXPERIENCE THE TRUE JOY OF LIFE. A popular national speaker, Steve has changed the lives of thousands who have heard him. Translated to book form, his philosophy centers on the simple premise that true success is not a thing you acquire or achieve. Rather, it is a journey you take your whole life long. Beginning with the compelling challenge to “Check Your Passion,” Steve ignites people’s ability to choose what they do, why they do it, and who they do it with. In his refreshingly straight forward style, Steve Gilliland shares unique insights into what it means to be successful. He enables listeners to identify their dreams and puts genuine success within their reach. 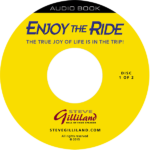 Add his humor and brilliant advantage of mixing words with wisdom, and Steve brings forth an audio book that truly motivates a listener to make changes and believe in the power of positive thinking. Success is not limited to those with financial resources or special talents. It is available to anyone willing to learn a few practical principles and then follow through with them day to day. All who listen to this audio book will be glad they got their hands on it.